A pet hamster is at the centre of a bizarre police investigation after it was put in a sealed envelope and posted in a letter box, it has been revealed. It was rescued by a Cambridge postman who saw it wriggling as it tried to eat its way out of its cardboard prison. 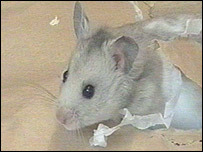 Patrick Von Heimendahl, a vet who examined the animal, told the BBC: "I find this utterly cynical to post a hamster. She is lucky to survive." The hamster, found in a post box, is being looked after by the vet. Mr Von Heimendahl added: "It must have been very hot in there and did not have any food in there or water. "I don't think she would have survived for very much longer." The hamster is thought to have been in the box for about four hours. Rob Maher, the postman who spotted the package, said: "I swore when I saw it. I was surprised and shocked. "They (anyone who posted it) must either have a grudge against someone or someone playing a sick joke." The hamster was found in the city centre box on Wednesday. Anyone with information should contact Cambridgeshire Police.